Mark Duplass is one weird guy. As an actor he’s the Indie King. The Puffy Chair, Hannah Takes the Stairs, Humpday, Greenberg, Your Sister’s Sister, Safety Not Guaranteed, and now The One I Love. He brings something unique to every odd film he’s in, something less Hollywood and more nerdy genius, a mix of quirky humor and awkward moments. And as a director, he’s just as kooky; Baghead, Cyrus, Jeff Who Lives at Home. You won’t watch one of his films and come away bored, even if you come away not really knowing what just happened. Never before has this been more true about a Duplass production than with this film. To start with, the plot is one giant “what the what?”, a mess of oddity that might scare away more down-to-Earth audience members. And secondly, Mark Duplass is in this film twice. That’s twice the personality and like I said, dude’s weird. Ethan & Sophie are a couple in crisis. After a cheating incident and a long struggle to regain their happiness, this married couple it about to call it quits. They see a therapist together but nothing is helping, until the day he suggest they take a vacation. And not any vacation, but a weekend away to a retreat that has supposedly saved the marriages of countless couples. So Ethan & Sophie pack up, drive into the country, and try to enjoy their surroundings and each other in an attempt to salvage what was once so good. But things start getting strange when Ethan discovers a guest house on the grounds. Something is odd about the events that befall the couple whenever one of them enters the house, events that only one can describe and the other can’t remember. Will this wild weekend grant their wishes, or are Ethan & Sophie doomed to part forever? It’s a weird plot that I can’t go into very deeply without revealing too much. A lot of the fascination with the story comes from the unexpected; not plot twists exactly, and most of the film is presented knowing the secret of the guest house, but surprising and different at the very least. I know I keep using words like ‘odd’, ‘weird’, ‘strange’, and ‘different’, but that’s how this movie comes across. It takes a rom/com setup and turns it in on itself, making for an introspective and totally bizarre dramatic comedy that has real points to make. 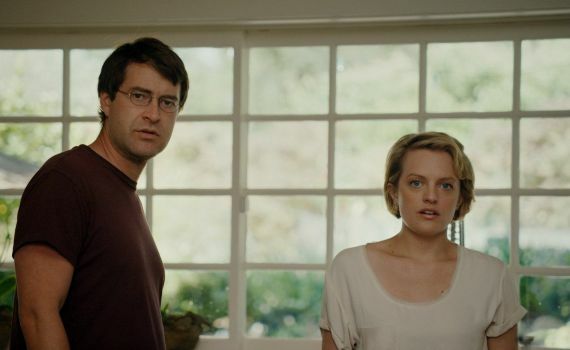 Mark Duplass will probably be the reason you either love or hate this movie. He is the star, though Elizabeth Moss splits screen time with him and holds her own. She just isn’t as vivid of an actor, letting Duplass shine brighter and take the credit or the blame. It’s hard to recommend The One I Love since it is so unique, and it’s a fleshed out short film, which always makes you wonder if they ought not to have just stuck to the original format. But it’s not long, it’s not bad, and it’ll at least make you think, ultimately becoming a movie I enjoyed but didn’t love.